As it should be, Labor Day weekend was full of sun and adventure (and even a little bit of labor). As part of our ongoing effort to meet new ultimate players around the coast, Doug, Jesse, Jon, the other Doug and I went to New Orleans on Sunday to play some pick-up ultimate frisbee. Meeting up with a local group, we played for several good hours on the lawn in front of Audubon Zoo. One of my goals is to spend more time in New Orleans, and a frisbee game every few weeks is a great reason to go over. Staying over in the city, I joined my friends Seth and Emilie on Monday afternoon to help out at their house, which they are renovating and have just finished re-roofing. 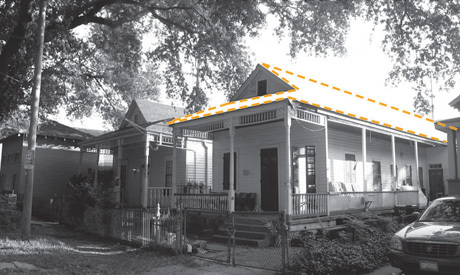 A historic “camelback” shotgun house on Louisiana Avenue, it’s surprisingly spacious and will be divided into two units; the primary apartment in the front and a rental unit in the two-story portion in the rear. A complete renovation is a huge undertaking for two people, but it will be an amazing house once it is finished. Seth and I spent the afternoon pulling up floorboards and adding new floor joists in the upstairs bedroom to create a second-story cantilevered porch. After a productive afternoon, we were joined by a bunch of their friends to celebrate Labor Day and the completion of the roof.